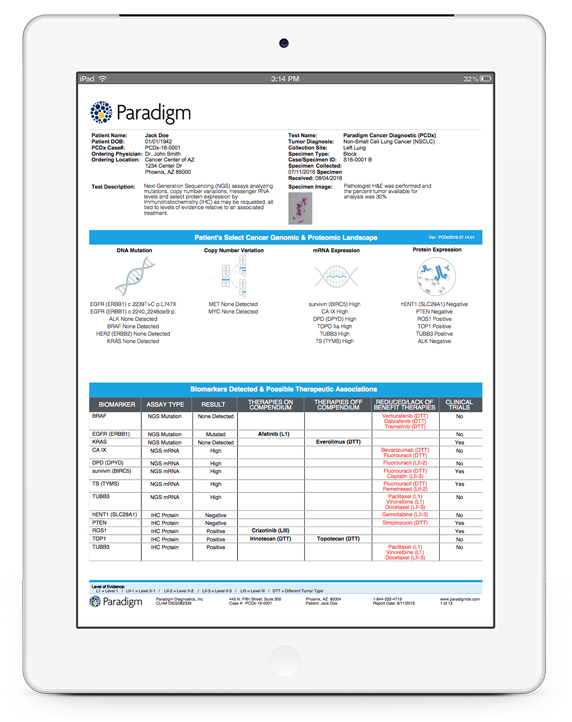 Paradigm Diagnostics has launched its personalized medicine cancer registry, designed to allow physicians to better collect, share, and visualize oncology data. The Paradigm registry—published in an article entitled “A Prospective Registry Study to Evaluate the Efficacy of Precision Molecular Testing in the Treatment of Advanced Solid Tumors”—builds on a study published last year in Oncotarget by researchers at the Indiana University School of Medicine. Study results showed that 19 of 44 patients (43%) saw increased progression-free survival after receiving therapy guided by the company’s Paradigm Cancer Diagnostic (Paradigm PCDx™), compared with 3 of 57 patients (5%) that did not. Many patients who showed exceptional responses were treated based upon therapeutic associations driven by Paradigm's mRNA and protein-expression analysis, according to Paradigm. Phoenix-based Paradigm says it offers accurate, comprehensive, and clinically actionable cancer genomic profiling and therapeutic information in 4 to 5 business days through Paradigm PCDx, a comprehensive sequencing test that analyzes DNA, RNA, and protein by immunohistochemistry. The test interrogates the most relevant genomic targets at over 5,000x average depth of coverage with 72 therapeutic associations. PCDx is typically used for refractory cancer patients, as well as patients with cancers that are rare or of an aggressive nature with limited treatment options. According to Paradigm, PCDx aims to provide physicians and patients with more precise information about the specific cancer pathways in the tumor to allow for more effective decision-making. Paradigm said it is now working on registry collaborations with undisclosed, large, community oncology networks and academic health systems, with the goal of leveraging existing infrastructure and clinical trial resources. “We look forward to helping expand this project quickly across multiple institutions to advance cancer care,” stated Janakiraman Subramanian, M.D., of St. Luke's Cancer Institute in Kansas City, MO, a co-Investigator on the Paradigm registry. “We're re-imagining how a diagnostic company works,” Dr. Morris declared. In November 2016, Paradigm closed a $7 million series B financing to support the registry and other initiatives. The round was led by Mesa Verde Venture Partners, with participation by New Science Ventures.